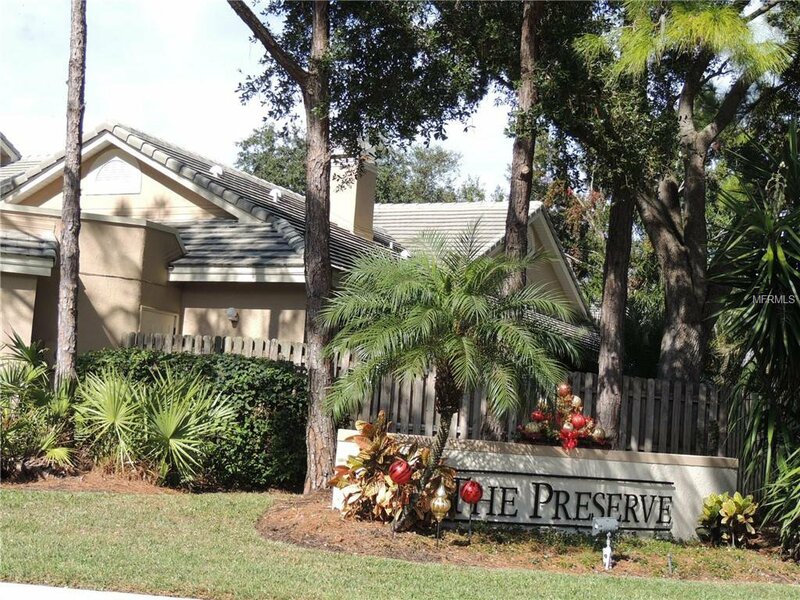 Beautiful one story townhome with 3 Bedrooms, 3 full Baths, office/Den, Pool and 2 car Garage in the Preserves in the gated community of Placido Bayou. This 2,085 sq ft Cottonwood model, with cathedral and vaulted ceilings, offers loads of room for entertaining not only inside, but also outside with the huge screened enclosed patio with custom brick decking around the absolutely gorgeous Pebble-Tec heated pool with spa which have an energy efficient heat pump for enjoyment all year long. It also has a separate living room, dining room and family room with a wood-burning fireplace. Improvements include Hardwood and Tile floors, Plantation shutters, granite counter tops in the kitchen and bathrooms. The master bath includes double sinks, custom designed cabinetry with electric outlets in the countertop cupboard and in drawers so your hair dryer is always ready to go. The shower has a floating door, seat and built in niche. Totally new A/C system including all new duct work in 2012 with A Nest thermostat for easy and efficient control of the system. The home has hurricane shutters and newer hurricane rated garage door. I'm sure this is the one you've been looking for. Call today!! Listing courtesy of HOFACKER & ASSOCIATES INC. Selling Office: RE/MAX CENTRAL REALTY.